For lunch we finished baking two panini roll, stuffed in some Swiss cheese and filled with hot Bacon and Black Bean Chili, finally finishing the chili! Swiss slices are 12 for $3.99 or 34c per serve. While a little messy, this was really tasty for 97c per serve. 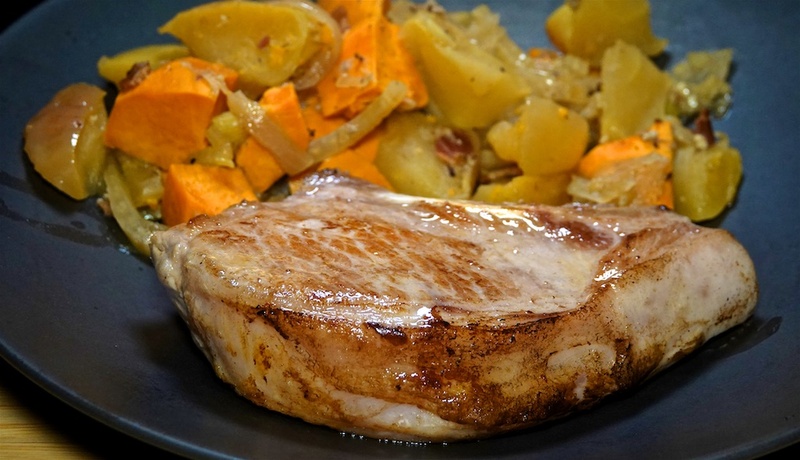 One of our favorite items in the Keller Crafted meat box are the dry aged, bone in pork chops. Tonight we souse vidé them to 135 degrees and then pan seared them for color. That’s a little lower than normally recommended for medium, but with the pan sear, it turned out perfectly. The Apple stew was left over from two nights ago. The pork chop was perfect. Juicy, but cooked to a perfect medium rare, we both thought it was the best pork chop we’ve ever had. The Apple stew, with some remaining pork flavor, was a perfect side. An expensive home cooked meal, but one worth every penny at $18.10 per serve.